At Action Wildlife Removal, our professionals provide safe, humane, reliable and effective coyote removal, trapping and control. If you have a coyote in your premises, threatening your livestock or pets, we can help you. There is not a coyote problem that we can’t handle. Coyotes can easily smell animals like dogs, cats, chickens, sheep and ducks from a very far distance which poses serious threats to your pets. They can also dig irrigation lines and destroy crops. 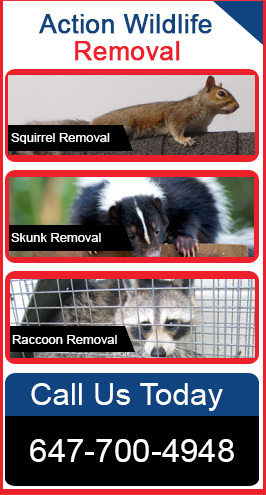 We, at Action Wildlife Removal, will stop the threat so that you and your pets can live in peace. We implement top quality coyote removal equipments and techniques to prevent the issue in a discreet manner. The coyote is a small to medium size canine having a slender body and a bushy tail. They are brownish and gray with a light cream colored belly. An adult male coyote weighs from 25 to 40 pounds and females weigh between 20 to 30 pounds. Coyotes are omnivores and can live up to 10 years in the wild. They mainly feed on small rodents, pet food and garbage. Coyotes are very adaptable and opportunistic. They are primarily seen hunting in groups. Coyotes can easily dig their own burrows, but often found enlarging a groundhog burrow to den in. They are extremely dangerous animals and it is advised to never feed a coyote or try to pet a coyote. Since coyotes are opportunistic creatures, they often come into conflict with people in urban and rural areas. They can feed on all sorts of wildlife, including mice, rats, raccoons, rabbits, squirrels, porcupines, feral cats, ducks, geese and many more. They can also spread fleas, ticks and many other parasites. The best way to get rid of coyotes is through trapping and exclusion. Moth balls, ammonia, repellents and other methods cannot prevent them from your premises. Our experts at Action Wildlife Removal will trap the coyote and relocate them far away from your dwellings. Our trained professionals can help you remove the coyote that is causing problem for you, your family and pets. Mississauga, Brampton, Georgetown, Guelph, Bolton, Caledon, Orangeville. Call us today to book an appointment for Coyote Removal Services!